Trivial Pursuit Game Only $1 (Reg $30) 11/27 & 11/28 Only at TRU! Whoa! 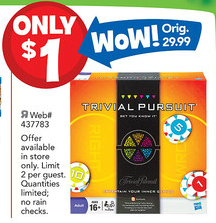 Today and tomorrow only, you can score the game Trivial Pursuit for only $1.00 at Toys r Us! This is an in-store only deal and you can grab two games at this price. This is a great game that regularly costs $29.99 and definitely worth the trip or phone call to see if your local store has them in stock. You can see their ad here.